It was a dark and stormy night, and I was busy saving the world again, when the phone rang. It was Tom Reeve, an old friend and a poet nearly as famous as Gary Snyder. "Have you a minute to spare? I believe I am losing my mind." I was thinking that if this was about losing his mind, a minute was more than enough. Then I heard him wail. That kind of wail meant only one of two things. Either he was hung over again, or he really was losing his mind. In either case, it was a dangerous situation. "You're ready to take a road trip?" "Be serious! I'm in pain." "That's what you said when I stopped you from blowing kisses to Gina." "Stop it. This is about a goose." "Not that kind of goose. This one is magical." "That's exactly what you said about your plans for Gina." "Listen. Shut up for a second. 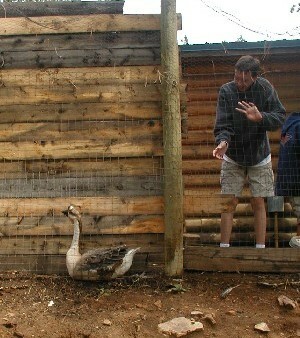 I have an African goose. 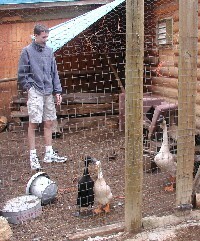 Each night I lock her into the chicken coop along with the chickens and ducks. I latch the door. The coop is solid. I have checked the place out. It's the poultry equivalent of Alcatraz." "So every morning when I go out to loose the flock, there is the goose standing on the outside of the door. The rest of the flock is still inside. And the goose is just standing there laughing at me." "I know. But it's true!" "How can a goose laugh?" "You dolt! The goose gets out! It escapes! That's the problem." "Are you sure you weren't wearing your cross-country ski outfit? That would make anything laugh." "I give up. I don't know why I called you. Send some nice flowers to my funeral. It's been nice knowing you." "Okay. Okay. Calm down. I get the picture. You've got a goose on the loose, and you don't know why." "We'll be there in an hour." I brought the whole crew: Monica, an expert on poultry, particularly on whether it tastes best with a white or a rose. Tote who, when I told him what was up, just rolled his eyes, as if to say "why are all adults crazy?" And Maggie who appeared to listen carefully and then asked whether we would be stopping for ice cream on the way home. The crime scene was abandoned when we arrived. A set of fresh truck tracks leading away from the Reeve Estate told the whole story. Tom couldn't take it any more. He had retreated and left the goose holding the field. I wasn't surprised. I had seen stronger men break when they came up second best to a goose in a trial of wits. There wasn't any time to lose. And then I saw her - the goose. An evil-looking goose, if I ever saw one. I have seen tough chicks, cocky roosters and plucky hens, but this foul fowl really got my goose. 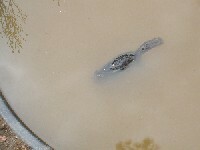 She eyed us from across the yard. At first we kept our distance. The coop seemed sound. The latches - top and bottom - solid. The hinges tight enough. As a test, we decided to lock Maggie into the coop and see if she could get out. 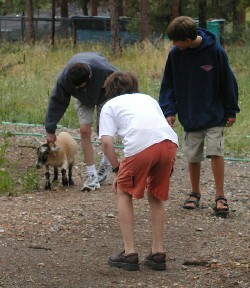 We had just latched the door when we noticed a goat wandering around what passes for Tom's front yard. I suppose we had overlooked the goat while we were examining the coop. Now we had two escape artists on our hands. 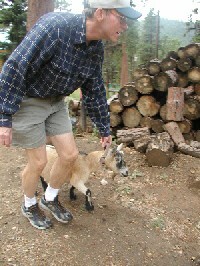 By the time we had chased down the goat, Maggie was laughing too hard to move, let alone try to escape. Time for plan B. Tote suggested we lock the goose in the coop and see how she escaped. Monica said the goose was too smart for that. Maggie suggested we all hide behind the woodpile where the goose wouldn't see us. Then we could peek out at the goose and undoubtedly catch a glimpse of the goose using wire cutters on the fence or planting plastic explosives or some other nefarious operation. We gave it a try. Tote chased the goose into the coop and latched the door. As I checked that everything was secure, I felt a bit like I was inspecting Houdini's handcuffs. They always looked solid but somehow he still escaped, leaving the marks standing around looking stupid. We retreated to behind the woodpile and waited. Then I heard a sound. I braced myself. It sounded like a giggle. I glanced around me and located the source. It was Maggie. You just can't get good sidekicks these days. That's when I noticed the goat again. This time out in the pasture. It was a conspiracy. The goat and the goose were in league with each other. "Careful," I told myself, "If you keep thinking like that you'll be as crazy as Tom. Next thing you know, you'll be writing poetry in the loony bin." I chased down the goat and finally got a hand around its collar. While I dragged the goat back to its pen, Maggie and Monica checked out the pond. What they found made the hairs on the back of my neck stand on end - a corpse. A drowned chipmunk. This goose would stop at nothing. While I mulled over this new development, Tote shouted. Sure enough. 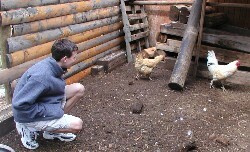 He had found a feather - too big for a chicken - wedged into a tight space on the left side of the coop. By the time I had reached him, he had found two more. Tote was on the trail. "I found it! The bird has a secret passage." There it was: a secret passage leading out of the coop. 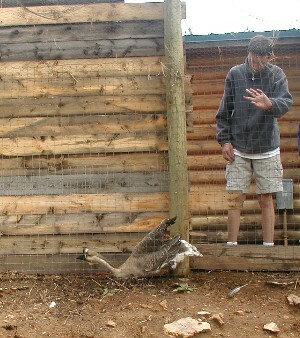 The goose had a carefully camouflaged tunnel between two layers of chicken wire on the left side of the coop. The coop only looked solid. Confronted with the evidence, the goose just looked smug and more defiant than ever. Sometimes they break easily, but this wasn't one of those times. This was one tough goose. Tote glanced at me. Time for the bad cop. "Stay out of this Dad." Tote chased the goose into the coop and closed the door behind himself. "Only one of us gets out of here, Goose." That did it. The goose might look tough, but it was really a chicken. She made a desperate but futile dash for freedom. We had it red-handed or flat-footed or something like that. Another mystery solved, and Tom's goose saved once again.